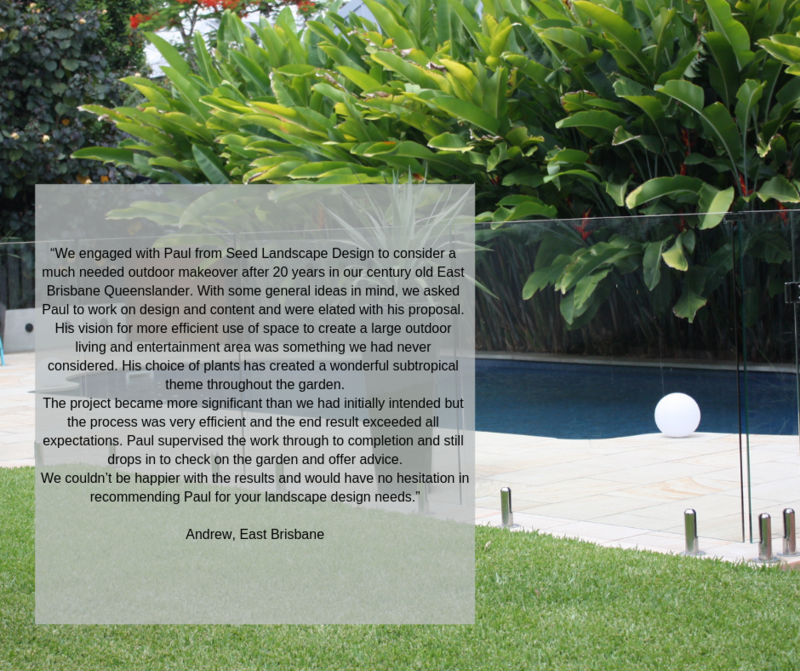 Swimming pool and entertaining area design for a traditional Queenslander. 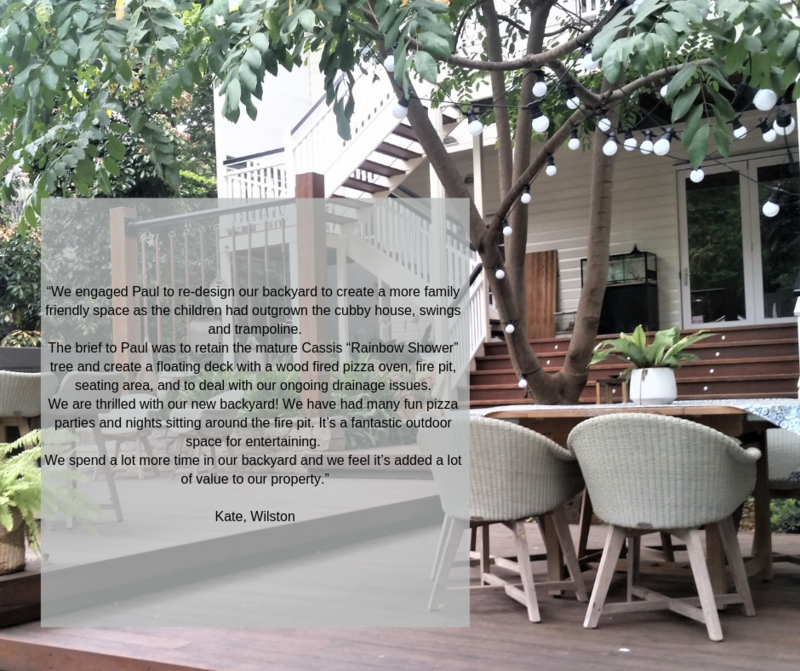 The clients of this gorgeous Queenslander in Rosalie, Brisbane, wanted to create a grand entry to compliment the staircase and traditional frontage of their home. The original pool area at the rear of the property was cramped, with a passageway between the deck and pool fence. Turf struggled here due to the south facing aspect and wet ground ( from pool splash and general dew/rain unable to dry out suitably). We extended the pool zone to the deck, and replaced the stainless steel wire balustrade with frameless glass to open visuals to the pool and create a general open feeling. The decked entertaining zone from building was detached from yard, and the pool was enclosed and out of view due to a climber over the pool fence. Our clients requested a decking podium at the most elevated position to maximise the views over Rosalie. We linked the deck to the decking podium via a boardwalk, continuing the use of timber as a feature material. The pool shape was outdated with curves in the corner of an L-shape. We hid the curve in the pool with a sandstone seating plinth. Ashlar sandstone continued the theme from the front with walling to the pool/boundary providing a ‘heavy’ element to define space. We added a water feature that spouts into the pool from the wall. We also designed an outdoor shower to the pool area. A sandstone plinth in front of the decking podium defines this area as a separate space, while providing casual seating to the elevated platform. The existing cubby house was retained, and was ‘stencilled’ with urban art (graffiti) on the facade. This style of colourful art contrasts with the formality of the sandstone and timber, and adds an element of interest in the design. The screen trellis was designed to recycle the old stainless steel wire balustrade and is now a feature in its own right. We chose a rambling, colourful, adaptive cottage/provincial-style planting to suit the architecture at the front of the property. Deciduous shade trees were chosen to shelter the seating zone (shade in summer, sun in winter). The trees also ‘ground’ the building with vegetated height to reduce the severity of the elevated building, and screen the sunken garage. Our Clients wanted an open space as a feature of their home's entry for play for their young family. The grandness of the house required an era-sympathetic design, but informal layout to allow change with the clients' needs over time. The stair needed rail for safety, so a continuation of the existing balustrade was suggested. Cobble granite pavers brought the landscape surface back to the right era, while giving a subtle contemporary flavour. A split path provided opportunity for feature planting and reduced the impact of the wide path and stairs. Sandstone suited the building's history and we used sandstone blocks to create a formality to the entry courtyard, while the granite stone tones imitated to complete a continuous material palette. 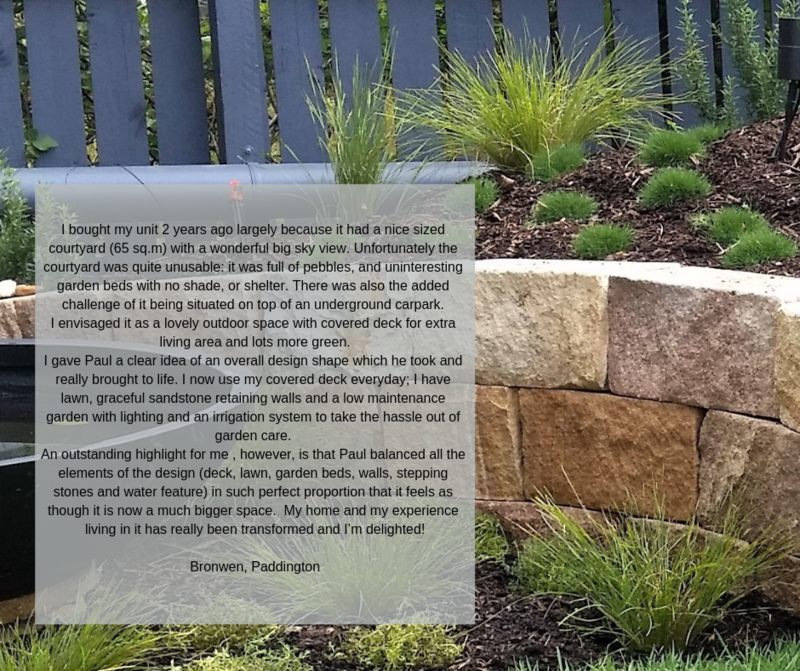 Convenient seating was integrated into the design to allow for casual contemplation in the garden, and to create a relaxing space to watch kids play. The vegetable garden to the side of house provides enough sun for plant growth, but shelter from burning western sun by the neighbouring building. Seating as per front garden is replicated here to the paved courtyard. The design consultation during the construction phase allowed the many changes to the design to be adapted to maintain the full design intent. Small changes have a rippled effect to the design, so having the designer look at it during the process can avoid larger issues later on.